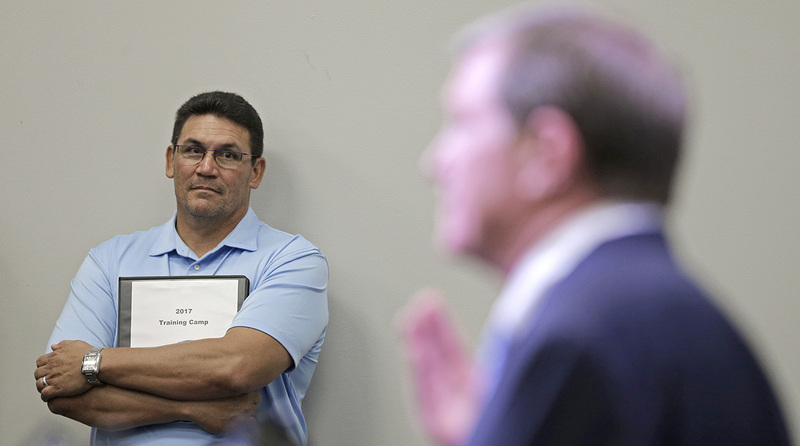 Ron Rivera certainly didn’t expect to spend the final Wednesday before the start of training camp like this—showing and explaining his roster to a new general manager, and catching him up on all that’s happened over the last four years in Charlotte. It helped that the guy who was literally a few hours into the job, interim GM Marty Hurney, also happened to be the old general manger. Given how coaches seek routine as things ramp up, it was undeniably strange. And yet, as the old colleagues (Hurney and Rivera worked together in 2011 and ’12, before Hurney was fired in October of ’12) went through this crash course, a funny thing happened. The coach wasn’t just teaching. He was learning. So while they’re just one day into this unusual arrangement … so far, so good. “It was a great exercise,” Rivera said over the phone, as he came out of the meeting. “His comments, his objectives, his perspective, here’s a guy that did it for as many years as he did, and he was out, but still an observer from the outside looking in. There are a lot of guys he has no attachment to, and some of his comments were pretty blunt, some of it was surprising. In some cases, Hurney suggested moving a player from one position to another. In others, his assessment diverged from Rivera’s. And at the end of the session, Rivera gave Hurney more to watch—specific guys in specific games from last year, and specific moments from the spring that’ll help the interim GM get up to speed. In this week’s Game Plan, we’ll dive into the Cowboys’ challenges with Ezekiel Elliott, the Redskins’ future with Kirk Cousins, the next quarterback to bust a budget, how the Steelers see Le’Veon Bell, and why comparing NBA contracts to NFL contracts is idiotic. We’re starting with the story of the week—and this NFL summer’s second firing of a GM who made the playoffs three times in four years. Rivera listened to Hurney address the press on Wednesday. So why is Dave Gettleman gone and Hurney back to steer the ship to the shores of next offseason? As I understand it, and as a few of us reported this week, it was as much about clashes with players in contract negotiations (and how some within the personnel department felt about his tough manner) as anything. Internal speculation about the future of the team past Richardson’s ownership didn’t help either. Whether Gettleman deserved his fate is certainly open for debate. To be sure, Rivera was plenty surprised when he was called to owner Jerry Richardson’s office on Monday—just back from vacation and with his training camp plan in tow (he figured that’s why Richardson wanted to talk)—and told Gettleman was gone. But what he didn’t have in the aftermath was time to ponder why it went down. This is where he and the Panthers are now. And so there he was watching film with Hurney on Wednesday, and thinking about how he’d address this second elephant in the room—the other one, of course, being the team’s 6–10, Super Bowl hangover of a 2016 season—when his players report to training camp in Spartanburg, S.C. on Tuesday. The good news is the message he was planning to deliver, to put the ’16 downturn to bed, ties right into dealing with this newfound organizational tumult. “I have a friend who recently had a heart attack, and I called him and said, ‘I’m so sad that this happened to you,’” Rivera said. “And he said, ‘Ron, it’s not really what happened to me, it happened for me,’ basically telling me that he had to change, there are things he had to alter. Well, it’s the same thing for us. The way he put it to me made me realize 2016 didn’t happen to us, it happened for us. And that’s where Rivera can pivot to what’s ahead in 2017, and how he plans to get the team back to where it seemed to be coming out of 2015, with an ascending core that Gettleman reworked and made younger around foundational pieces left over from the Hurney Era. Part of that is assessing the damage of ’16, and in going there, Rivera will start with the start, and how the team had to relive its Super Bowl loss to the Broncos for much of the summer as they prepared to play Denver in the opener, and how the Panthers would lose that opener in heartbreaking fashion. Just as Arians said that the Cardinals lost their swagger in Week 1, the Panthers showed every sign they’d lost theirs, too. They went 2–6 in games decided by three points or less. They lost left tackle Michael Oher and blew a lead against the Vikings in Week 3, setting off a four-game losing streak that sent Carolina into its bye at 1–5. And going through all of this with Hurney reinforced that. As Rivera sees it, Hurney left a team on the verge in 2012. He’s back with a group that’s fully evolved. In the nearly five years since Hurney’s departure, Rivera’s place within the organization has moved forward too. And given that the team has lost its president (Danny Morrison), GM, director of player personnel (Brandon Beane) and defensive coordinator (Sean McDermott) since the first of the year, he knows it’s now on him to be a stabilizing force in choppy waters. Of course, there are only 10 players left (11 if you include the returning Julius Peppers) that Hurney acquired, and there’s almost no precedent for this sort of change on the eve of camp, and that means there are blind spots ahead. And when there’s a move like this, there’s always the lingering question of who might be next. But if Rivera’s taken anything from this week, it’s that there’s not much time to waste energy dwelling on what just happened—a lesson he hopes his players learned no just over the past week, but over the last year. • THE MMQB’S ALL-TIME DRAFT: How would you go about building an NFL team if you could draw from a pool of every player in football history? Our 12-man panel of personnel experts gave it a shot. 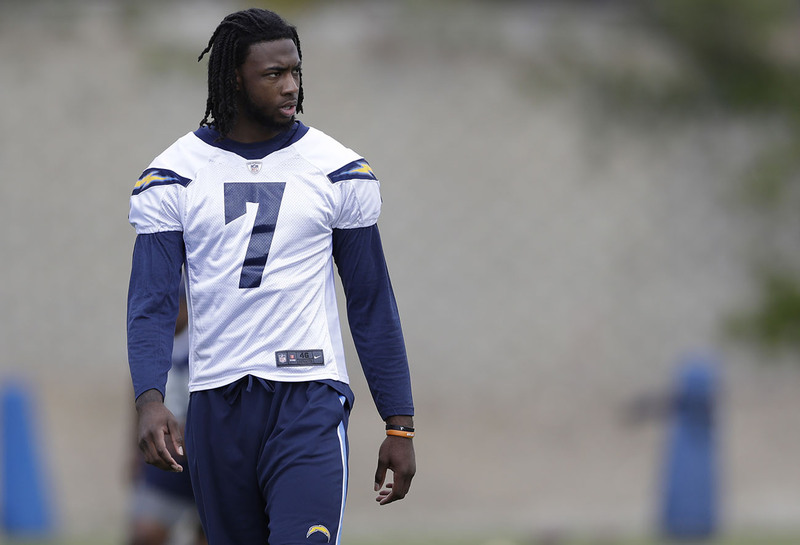 The Chargers didn't shy away from Mike Williams on draft night, despite his back issues. 2. It’s worth repeating: Anything that the Cowboys get from 2016 second-round pick Jaylon Smith while he’s still wearing a customized Richie brace (a brace he’s worn for the last year that serves the same purpose as an AFO) to support his foot is gravy. 3. WR Mike Williams’ back issues were no secret before the Chargers took him seventh overall, a risk similar to the one Buffalo took on DE Shaq Lawson in 2016. It’s interesting, too, considering the wide-spread injury problems that torpedoed ex-coach Mike McCoy’s final two seasons. 4. Cardinals RB David Johnson told colleague Andy Benoit that he hopes to help change the way guys at his position are paid. Then, he told SiriusXM Fantasy Sports Radio he wants 30 touches a game. Memo to Johnson: Putting the miles on your legs won’t help you accomplish the former. 5. One leftover from my analytics piece of late June: Advanced statistics insist that reigning defensive player of the year Khalil Mack, based on his 2016 pressure numbers, should easily top the 11.0 sacks that he posted last year. 6. It seems to be slipping under the radar that Saints QB Drew Brees is not only in a contract year, but he also has a clause in his contract preventing the team from franchise tagging him in February. It’ll be an interesting year in New Orleans. 7. Ditto for Minnesota. It’s still too early for the team to know what it’ll get, if anything, from the rehabbing Teddy Bridgewater. Coach Mike Zimmer told me: “He’s still got a long way to go.” And Sam Bradford’s in a contract year. 8. Brandon Williams’ comments that this year’s Ravens D could rival the 2000 Baltimore group is a bit much. But in the spring, team decision-makers, who spent two years drafting to get more athletic on that side of the ball, saw that athleticism start to come to life. 9. I’ve mentioned him before, but file away Bucs WR Chris Godwin’s name (you’ll see him on Hard Knocks). He’s mature, has impressed with his speed, strength, hands and concentration, and has shown the NFL isn’t too big for him. 10. It’ll be interesting to see where the learning curve for new Chiefs GM Brett Veach is. He’s spent most of his career as a road scout, and generally there’s an adjustment to working out of, let alone leading, an office. ​1. 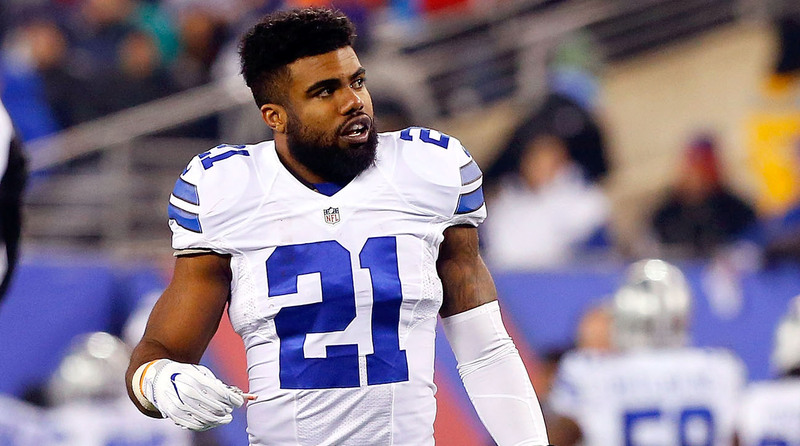 Ezekiel Elliott’s issues follow him. In the August 25, 2016 edition of the Game Plan, we had an NFC area scout saying this about Ezekiel Elliott: “As a player, I loved him to death. He’s the highest graded back I’ve ever done. He does everything well—running, catching, pass pro. But as far as going to Dallas, the bright lights, big city, I’ve always thought that could be tough for him. … He likes football. He also likes everything that goes along with being a star.” So right there is the problem that Dallas has. It’s not that he was allegedly involved in a bar fight on Sunday night. Those sorts of things happen with guys in their 20s, and we don’t even know yet his level of responsibility in the altercation. It’s that there was a pattern of behavior from Elliott coming out of Ohio State that’s continued right into his NFL career. The incident on St. Patrick’s Day can be connected to this one in that they both trace back to his partying. Like our scout said, Elliott has always liked being out on the town as a star and he’s always been able to manage it. “We knew he burned it at both ends,” said a scouting director with one team that was in the mix to pick him in 2016. “Thing was, he’d go out and party and come back the next morning and be the best worker in the weight room—kind of the typical freak athlete who could pull that off.” Likewise, last year, he reported to camp overweight (at 231 pounds), and still won the rushing title. On the flip side, it’s not like there weren't concerns over this stuff in the past. In fact, before the 2015 season, his Ohio State teammate Joey Bosa was suspended for a game and decided, as a result, to move out of the apartment he shared with Elliott because he wanted to get himself out of that environment. Bosa, like Elliott, had to answer for his partying before the draft, and told teams then that his move was, in effect, his way of turning the page on it. Now, the Cowboys have to hope Elliott makes a similar decision. And to be clear, that doesn’t mean he has to stop going out—I’d be a gigantic hypocrite to tell any guy in his 20s that. It means he has to manage it better than he has. I remember hearing stories about Peyton Manning and Tom Brady going out and partying when they were younger, and how they’d make sure they were in very controlled environments when they did. That, of course, is acknowledging that there’s a price that comes with fame. Elliott knows about that price now. Whether he can stop paying it remains to be seen. 2. Kirk Cousins’ position keeps getting stronger. The Redskins’ May 2 offer to Kirk Cousins looked like this: $53 million fully guaranteed between 2017 and ’18, and a non-guaranteed figure of roughly $20.5 million in each of the four years to follow. And that means the deal was, in essence, a two-year contract at a smidge over the price of the franchise tag this year added to the transition tag next year ($52.68 million), with four team options from 2019-22 at a figure that would rank around 14th among quarterbacks in 2017. That should illustrate why—in addition to the psychological factors we detailed on Monday—the financial piece of the negotiation was never close to working. And the tough thing now for the Redskins is the math will change in a year, again. Say the Redskins transition-tag Cousins at $28.73 million next winter. Then, the lower end for the first two years becomes two transition tags, which would add to $63.21 million. The higher end would be a transition tag, plus a franchise tag for 2019 (144 percent of the $28.73 million), which adds up to $70.10 million. And if they franchise him at $34.47 million next year, then the two-year floor on a long-term deal would be that figure, plus a ’19 transition tag (120 percent of that), adds up to $75.83 million. So gather all of that, and know that where the Redskins were looking at having to pay between $26 million and $30 million per in the first two years of a deal, the same math says they’ll have to pay $31.5 million and $38 million per in the first two years of a long-term deal next year. Now, maybe this year goes great, and Matt Cavanaugh seamlessly replaces Sean McVay as offensive coordinator, and Josh Doctson and Terrelle Pryor prove suitable replacements for DeSean Jackson and Pierre Garcon, and the scouting department is humming by winter, and Cousins—whose first child is due in September—wants to stay. If all that happens? This still won’t be easy. Washington tried to get Cousins to do a deal before the March deadline to tag players (offering him a five-year, $100 million extension with $40 million guaranteed), and Cousins refused because he knew the value the second tag had in getting him to the budget-busting third tag. Which tells you that taking care of the personal piece here—and team president Bruce Allen tried to work on that by traveling to Michigan and sitting down for four hours with Cousins and his dad last weekend—will simply clear the way for the sides to handle a complicated business deal. • DON’T ASSUME COUSINS IS GOING TO SAN FRANCISCO: Peter King on why Washington might end up tagging Cousins once again. 3. Matthew Stafford has next. All that math we just detailed? It’s why Cousins is carrying the hammer that Derek Carr didn’t really have to change the way quarterbacks are paid. And maybe Cousins eventually will swing that hammer and wreck the market—that is, if Matthew Stafford doesn’t do it first. In June, Lions president Rod Wood told ESPN, “It’s going to be whatever it takes, I think, to make it happen from both sides. And whether he becomes the highest-paid or not, it’ll be a short-lived designation because, as [GM Bob Quinn] said, and I think it’s true, if you’re the top whatever of quarterbacks, when your time comes up, your time comes up, and then somebody else’s time comes up, and they become the highest [paid].” Take those comments, and fast-forward a month, and the easy thing to do is point to Carr’s $25 million-per-year megadeal as the standard bearer. The problem with that? Stafford’s franchise tag number for 2017 is $26.4 million, which means the total to tag him twice would by $58.08 million and makes it reasonable for him to ask for a deal closer to $30 million per. Will he? He could, and change the price tag for quarterbacks that way. Or he could compromise and set precedents that would help players in other ways going forward. This, in fact, is how the paradigm on guaranteed contracts could change (more on that later): A player like Stafford says, O.K., since you don’t want to go to that number, how about guaranteeing my money into the fourth year of that deal, or just fully guaranteeing a shorter deal so I get another shot at this in my 30s? The bottom line is that the leverage Stafford has to ask for a bigger chunk of his team’s cap than others can give him a powerful bargaining chip. It’ll be interesting to see how he uses it. 4. Steelers confident Bell will be fine. Pittsburgh made an earnest effort to get Le’Veon Bell under contract long-term—and even though it didn’t work, and he’ll play out the season on his $12.1 million franchise tag, my sense is there’s not a lot of concern on his readiness for 2017, regardless of when he decides to sign his tender and show up. Though he never officially reported, Bell did pop his head in at the Steelers facility from time to time during the spring, and he’s been texting with coaches and in touch with trainers. Yes, he has had the off-field issues, but as I’ve heard it from people there, there’s never been much of a problem with Bell during work hours, which buoys their expectation that he’ll be good to go. “Even if he doesn’t show up for camp, he’ll be ready to play, no matter what,” one staffer said. “I’m not worried about that. He’s always come in in phenomenal shape.” And if he is in camp, chances are the Steelers would manage him through it anyway. He averaged 28 touches per game last year, and has over 1,100 touches for his career going into this season. He’s still just 25 years old, but with that tread on his tires, and Pittsburgh’s desire to keep him around past 2017, and since a second franchise tag would cost the team $14.52 million, they’d almost have to give him a long-term deal to make that happen. It makes sense for him to be paced through the summer. NBA free agency has finally slowed down, and that means we’re in the tall grass of what’s become an annual rite: NFL players bitching about their financials against those of basketball players on Twitter. My lesson for you this week? Most of it is pretty stupid. And while he didn’t call it that himself, I figured I’d enlist NFLPA president Eric Winston to illustrate the point I’ll try to make here. “The math is apples to oranges,” Winston said on Wednesday morning. “Would you rather have half of $4 million or 10 percent of $10 million? I’m not saying that’s the best way to describe it, but the split is just much different. The math is completely different. And for the guys that might be upset, educate yourself on what you want, make sure your voice is heard, and be ready to fight. Winston, of course, is referencing the need for an ability to endure a strike or lockout in the winter/spring of 2021, which would go a long way toward the players achieving their objectives. NBA players make more than NFL players. Putting aside the simple fact that are more players per team in football than basketball (53 vs. 12-15), and more teams in the NFL than the NBA (32 vs. 30), which means the pie is necessarily being split more ways, what really matters here is the revenue split. And in particular, it’s the salary cap and floor. In the NBA, the floor is 44.75 percent of basketball-related income; in the NFL, it’s 47.5 percent of total revenue. On the flip side, NBA teams can spend past the cap and pay a luxury tax, which closes the aforementioned gap between the sports. But the idea that the NFL is giving its players a much smaller piece of its $14 billion in revenue than the NBA is of its $8 billion in revenue is just flat wrong. NFL players are fools for not getting guaranteed contracts. Outside of mechanisms governing rookie contracts, there is nothing in the CBA of the NBA, NFL, NHL or MLB that requires teams to give players guaranteed contracts, or prohibits them. The reason MLB and NBA players have fully guaranteed contracts is because that industry standard was established through individual negotiations, same way the standard for NFL players having to fight for their guarantees was. And really, if this is gonna change, that’s how it’d probably have to happen, starting with quarterbacks like Stafford and Cousins and Brees and Bradford (all four are in contract years), and trickling down from there. Why will it be tough? Part of it is the injury factor in football. Another is because there are so many players on every team. The great majority of players are seen, by clubs, as easily replaceable. There’s no equivalent for the franchise tag in basketball. The idea of the franchise tag isn’t dissimilar to the concept of max contracts in the NBA. Both limit the top end of the market, and are partly in place to protect the middle and lower classes of the sports. The difference, and this skews in favor of basketball players, is that while max contracts discourage movement from team to team (by allowing teams to pay their players more than others), they don’t prevent guys for switching sides. So it’s easier for NBA players to test the market, but their presence on the market won’t do a whole lot to change the market, the way it happens in football, because the ceiling is set. There are other factors here, too. The NFL is paying out $40 million per team in benefits, which the players negotiated for in 2011 and is part of their total take. And it’s important to understand, too, that revenue has risen at about the same rate as the salary cap, which is how the deal was designed. Now, is the CBA the best in sports? No, it’s not. There are still issues. And the good news, as Winston sees it, is players are starting to get more active in this arena ahead of 2021. Cousins has made it to the union’s annual summit three years in a row on his own accord. Chargers OT Russell Okung has been active in trying to learn more. Richard Sherman is getting the word out on what needs to be done.